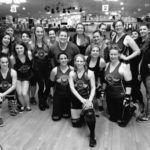 In front of a full house at the Grady Cole Center, the Charlotte Roller Girls, the Queen City’s only all-female, flat track roller derby league, fell short of a win in a physical match against the River City Rollergirls. Charlotte was in control for much of the bout, but the Richmond-based team rallied in the closing seconds to pull off a come from behind 85-84 victory. 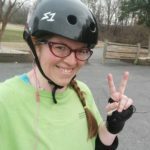 Rosie Cheeks led off as jammer for Charlotte. She outscored her opponent 4-0 and grabbed the early lead. In the fourth jam, River City moved ahead, but it was short lived. Charlotte pulled ahead in the seventh jam and never looked back. They maintained the lead for the remainder of the first period and headed into the locker room at the half with the score 45-37. In the second half, River City came out swinging. By the fifth jam, they had regained the lead but Charlotte rallied back. It outscored River City in nine out of the next 16 jams including a double grand slam by Court’her Pound’her in the 14th jam. Heading into the final jam, Charlotte led by a narrow margin. River City’s jammer quickly earned lead jammer status while Court’her Pound’her, Charlotte’s jammer, was sent to the penalty box. In control, River City outscored Charlotte to take the victory by one point. 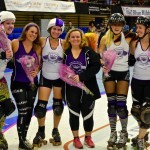 The next home bout for the Charlotte Roller Girls is on May 17 when they take on the Columbia (SC) Quad Squad. Tickets are on sale now.